I finished my first tugboat and I've started on another one. I've done some modifications on the second one to make it look different from the first. The third one will be a larger diesel tug. Nice looking tug, Dave. Great job on the small details. What scale is it ? at least they can find ya handy. Could you tell me what scale that is and who's kits they are? Please let us know whose kits they are. Hope they are O scale. The kit is made by Lindberg. 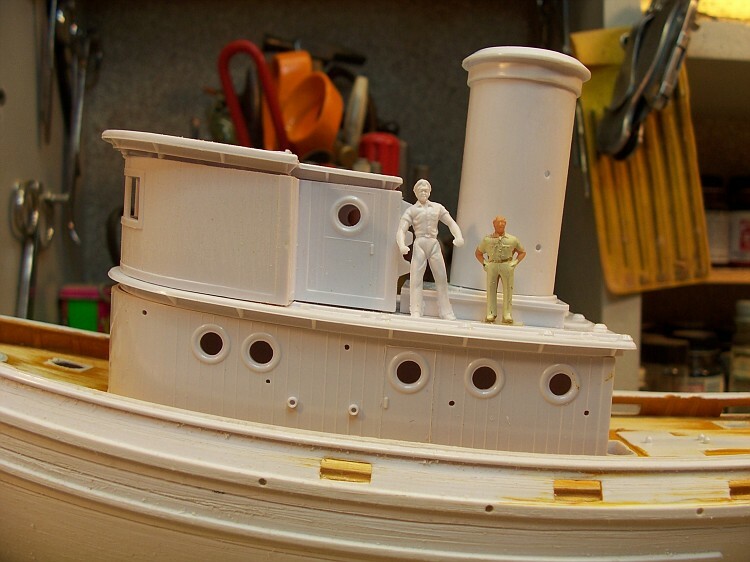 I measured it with an HO scale ruler and the hull works out to 85 1/2 feet which is about right for an east coast harbor tug. The men that come with the kit measure 8'6" tall. The men wouldn't even be able to stand up straight in the cabin. Even though something is out of wack with the scale on the kit, I think it looks OK for HO scale. If anything maybe a tiny bit big. Here's a picture with the guy from the kit and an HO scale guy. 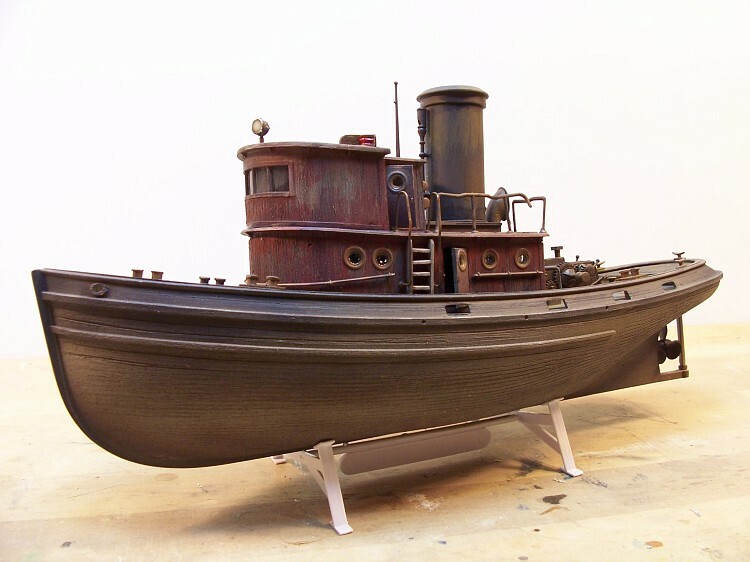 I am most impressed with this tug boat! I've had a harbor scene in the back of my mind for some time now. I did manage to obtain a 1/4" hull from a manufacture and planned on building up the rest. Very nice work!!! Ken, if you have the hull, this style doesnt look too difficult to scratchbuild. A few pieces and parts, a bit of scribed siding, a bit of steam for bending scribed siding LOL. I'm confident in your abilities to do one like this..............In fact, i could see even more detail added to this piece over time and once its in its final setting......you know, the stuff you come back too to Siper detail instead of saying OK my layouts done!! From what I have seen scratch building or bashing is about the only option umless you want to invest over 200 bucks for a 1/43 scale kit...ouch..again great work on that Dave.